Located just a 50 minute train ride from Hiroshima Station, Iwakuni is often overlooked by most tourists when they visit Hiroshima. The typical places people visit when going to Hiroshima are the Peace Park and Miyajima. Both are very important places to visit in one’s lifetime but the Hiroshima area has a lot more to offer. From reading various guide books and websites, I was told that spending a night at Miyajima is a great springboard for going to Iwakuni. Being only 50 minutes away from Hiroshima, it is not a difficult day trip to visit Iwakuni. It is pretty easy to head there and back to Hiroshima in a day, although it is not as easy as starting off from Miyajima itself. The trains to Iwakuni run frequently enough that you don’t have to worry too much about catching a train, unlike some of the other places I have visited where trains only come once every hour or so. Overall, Iwakuni is a great hidden gem that most foreigners and even Japanese people tend to miss when visiting Hiroshima. Iwakuni itself is not a spectacular city to visit. It is well known for their petroleum refineries as well as the US Marine Base. 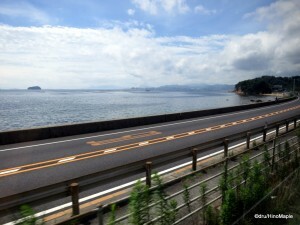 To get to Iwakuni, you must take the Sanyo Main Line from Hiroshima Station. The Sanyo Main Line passes Miyajima before heading to the coast of Hiroshima Bay. This is a very beautiful route as you can enjoy the beautiful coast as well as see several petroleum refineries along the way. It provides a very interesting sight that is not very common in Japan. As you approach Iwakuni Station itself, things become a little bland with nothing but big box retailers, industrial complexes and the thought of miles and miles of train tracks. Upon exiting the station, you will be greeted by Iwakuni city which was not very special. The station is nothing more than a basic central point for the city with lots of shops and shotengai. I wish I had more time to investigate the area a little more but my main goal in Iwakuni was to visit Kintaikyo and Kikku Park, so I spent very little time in the central city area. In fact, I spent about 2 minutes and all of it was between the station entrance and the bus stop. 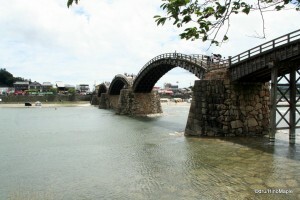 The main attraction of Iwakuni is Kintaikyo, or Kintaibashi as non-locals mistakenly call it. Kintaikyo can easily be mistaken as “London Bridge” due to the nursery rhyme about London Bridge as Kintaikyo has “fallen down” many times due to floods. Kintaikyo was built to withstand floods but due to engineering mistakes, it was destroyed three times due to floods. From the 1600s till 1950, Kintaikyo has been standing but it requires a lot of maintenance to keep it standing. The bridge has been “destroyed” roughly an additional 6-14 times due to maintenance. From 1600 till 1950, the central arches of the bridge were rebuilt every 20 years and the arches connecting to the land were rebuilt every 40 years. I cannot tell for sure if Iwakuni city is is still planning to keep rebuilding Kintaikyo to this schedule but from what I can tell it is no longer being rebuilt at this schedule but rather it is being maintained. 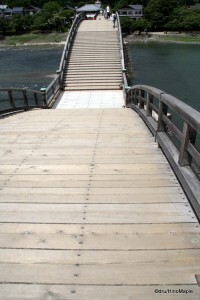 Kintaikyo was also famed for being one of the few bridges that was built without the use of any nails. Utilizing the tried and true method of interlocking pieces of wood along with a few metal bands to keep things tight, the bridge is primarily held up on its own. Today, the bridge deck is held in with nails but the main structure is made traditionally using the old traditions of real old wood as well as using a group of carpenters from several generations. Iwakuni city has decided to preserve the techniques learned from past generations and are doing their best to preserve it so that the knowledge of how to rebuild the bridge is never lost. The bridge itself was last rebuilt around 2004 where the reconstruction process itself was turned into a tourist draw. Today, Kintaikyo doesn’t feel like a huge tourist draw but it is the only tourist draw in Iwakuni. It is a very beautiful bridge that is very approachable. On both sides of the river you can walk down to the gravel river bed and walk under the bridge to enjoy the magnificent architecture and skill that it took to build the bridge. After having seen pictures of Kintaikyo’s underbelly, I was unfortunately let down a little by the view as it was exactly as others have photographed it. I found it difficult to find an interesting way to photograph it but it is still amazing to see what the people of Iwakuni did to create Kintaikyo in the first place. The river banks are also very nice places with many families enjoying a swim in the river and a barbecue on the riverbed. It is not the most peaceful place and the cars parked on the riverbed can be annoying when trying to capture the “natural” beauty of Kintaikyo in a pristine natural environment, but that would be giving a false impression. The cars bring home the reality that Kintaikyo is actually at the edge of the city where people go to relax and enjoy themselves by the river. 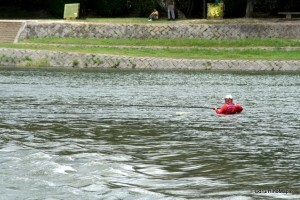 The river itself is famous for its fishing. On any given day you can see a few fishermen fishing for whatever fish they can find as the river itself is usually not very deep. Sometimes you can even catch cormorant fishing on the river where they take cormorant birds and use them to catch fish. This is not a daily occurrence but you might be able to see it if you time things right for the right festival. While Kintaikyo is not the only attraction of Iwakuni, it is the largest draw of Iwakuni. Most people will visit Iwakuni just for Kintaikyo. I wanted to visit Iwakuni for Kintaikyo myself and I am happy to report that I was satisfied with my trip. It is very easy to build up such a magnificent bridge that your expectations will be too high. I did this myself but at the same time I truly enjoyed seeing Kintaikyo and I have no regrets for visiting the bridge. My only regret is that I didn’t plan enough time to take my time to see it. Sometimes I have to rush to see everything I want to see and Iwakuni was one of those times. I had a set schedule as I needed to return to Tokyo on the day I visited Iwakuni but at the same time I made sure I spent enough time with Kintaikyo to enjoy the beauty of the bridge. It is hard to explain but as you walk over the bridge you will be in for a visual treat of being able to see the beautiful Kikko Park and Iwakuni Castle to the north, the small town side of Iwakuni to the south, and the river to the east and west. If you take the time to look down at the bridge arches themselves, you will notice that the steps are a little higher at the bottom of the arch than when you are at the top where there are no steps. As you crest the arch you will be able to appreciate the craftsmanship as the arch itself looks like a smooth arch without steps. It isn’t until you take two steps further than you see the shadows of each step. It is a great illusion that enhances the bridges beauty itself. If you are ever in Hiroshima with a day to spare, rather than going back to Miyajima, head further out to Iwakuni and enjoy this beautiful bridge. This entry was posted in Chugoku and tagged bridge, carpenter, cormorant, cormorant fishing, fishing, Hiroshima, Hiroshima Station, Hiroshima-ken, Iwakuni, Iwakuni Castle, Iwakuni Station, Kikku Park, Kintaibashi, Kintaikyo, London Bridge, Marine Base, petroleum, petroleum refineries, river, Sanyo Main Line, US Marine Base, US Marines, Yamaguchi, Yamaguchi-ken by Dru. Bookmark the permalink. I know this place! My host family took me to see the bridge when I was 16, I had no idea of its significance. Informative post, cheers!